from sullen earth, Isaac’s thoughts sing hymns at heaven’s gate. This is one theory. The other, more probably theory, is that he doesn’t believe we’re paying attention, so each statement is a question, a “did you hear these words, are you listening?” question. Well of course we’re listening! We catch his words as they float out of him, and they help to lift us up on even the dreariest of days. Speaking of dreary days, if you’re experiencing such a thing, make this soup! It’s warm and bright, a little spicy but very comforting. I made it with golden tomatoes from our garden, which gave it a pretty color. You could make it with any kind of tomatoes, though, it would still be good. We ate it almost as dal, over rice. I added some chopped baby spinach to mine. You could eat it just as it is, though, with some nice crusty bread, for a perfect autumn meal. Here’s As I Rise by the Decemberists. In a large soup pot over medium heat, warm the butter. Add the shallot, garlic, bay leaves and black cardamom pods. Stir and fry until the garlic starts to brown, about a minute. Add the rosemary, thyme, and hot peppers. Then stir in the split peas to be sure they’re well-coated with butter and herbs. Add the spices and stir to combine everything. Add enough water to cover everything by about half an inch. Bring to a boil, reduce heat, and simmer for at least an hour, until the split peas start to break down. Add the tomatoes, and cook for about another twenty minutes, until everything is soft and the broth becomes less clear. Add a little water if it gets too thick for you. You can leave it thick like a dal, or make it thinner like a soup. Stir in the lemon, basil, tarragon and salt and pepper. Serve over basmati rice, baby spinach, or as is. 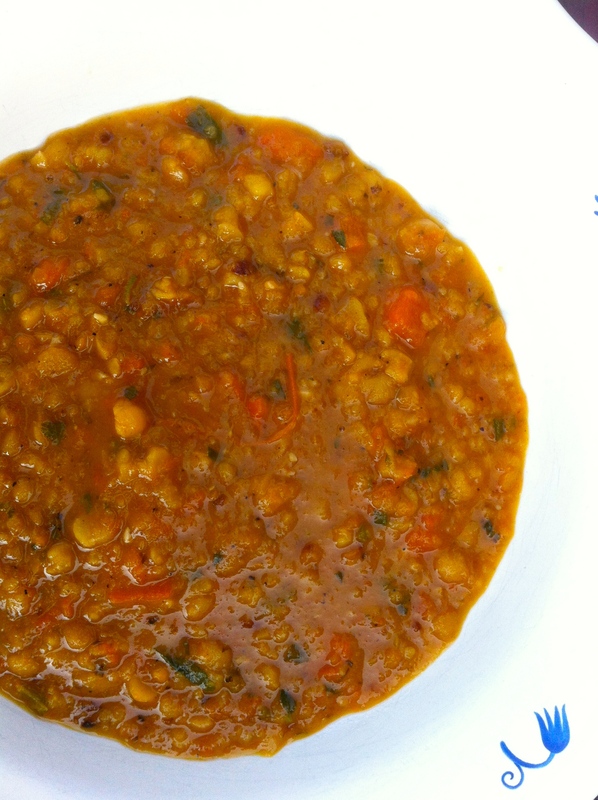 This entry was posted in beans, lentil, recipe, rice, soup and tagged dal, split pea soup, yellow split pea by Claire. Bookmark the permalink.